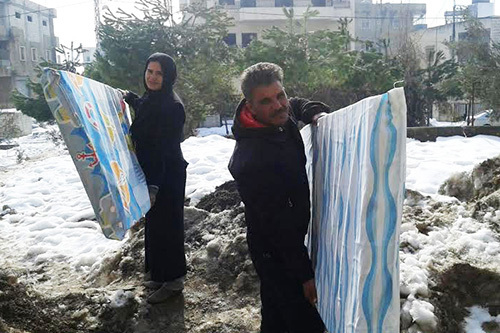 Through generous offerings, Texas Baptist churches and individuals have contributed over $17,600 to the Texas Baptists' Winterization Project, which is helping bring warmth and the Gospel to Syrian refugees in Lebanon. The vision behind the Winterization Project began developing in August of last year when Matt Snowden, chair of the missions mobilization team for Texas Baptists; Mike Stroope, associate professor of Christian missions at George W. Truett Theological Seminary in Waco; and Steve Seaberry, director of partnerships for Texas Baptists, visited Lebanon with the intention of strengthening bonds with the Lebanese Society for Educational and Social Development (LSESD) and the Arab Baptist Theological Seminary. As they witnessed the tremendous challenges and opportunities the Lebanese Baptist churches were facing in the midst of the Syrian crisis, which brought over 1.5 million refugees to Lebanon, the men each felt a tug on their hearts to seek a way churches in the United States can help their Middle Eastern brothers and sisters. Responding to that call commenced the development of the Winterization Project, which began taking offerings to send funds for winterization materials and Bibles in October 2014. "The response was positive and surprisingly rapid," Snowden said. "I am encouraged that more Texas Baptists are aware of the good work being done by our ministry partners in Lebanon…and I am encouraged by refugees experiencing the love of Jesus in deed and word." It was an unusually difficult winter in Lebanon as a fierce storm named Zina contributed to the death of some refugees and the infestation of hyperthermia in refugee camps in early January. Grateful for the support donated by ministry partners, Lucas Shindeldecker, LSESD community development director, said the funds have provided great assistance, but the need is still apparent. "This winter has been harder than last year with several winter storms dumping cold and snow in the upper elevations where a lot of refugees live," he reported. 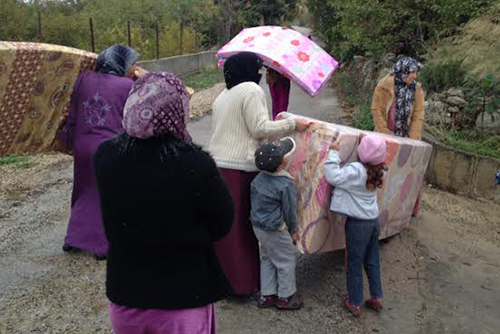 "With the first (portion) we provided refugees with blankets, mattresses, heating stoves and fuel for the stoves to help warm their residences. There is still great need as it is still quite cold and there are many families who need additional winterization assistance." In an interview with Jihad Haddad, pastor of True Vine Baptist Church in Zahle, Lebanon, he reported his church has been distributing food and winterization materials, teaching the children and hosting Bible studies for refugees, all of which have produced a radical outcome. "We believe this is the best way to demonstrate our Christianity through word and deed," Haddad said. Both church services have been packed on Sundays, he said, and they began Bible study home groups a few months ago, which have grown to take place in 25 homes. "We are in the frontlines of the battle," Haddad said. "Pray for some continuous support as we feel the enthusiasm goes down with time." The Winterization Project is an initiative of Texas Baptists' Partnership program, which provides opportunities for churches to partner with sister Baptist conventions and unions to collaboratively bring the Gospel to the ends of the earth. "Texas Baptists are Great Commission and Great Commandment people," Snowden said. "This collection is a tiny example of that reality." Texas Baptists would like to give thanks to the churches and individuals who generously donated toward the Winterization Project this winter. To continue supporting the initiative, visit texasbaptists.org/Lebanon. "Texas Baptists have always been leaders in missions and ministry," Seaberry said. "Their generosity in giving to the Lebanon Winterization project is another example of our commitment to the Great Commission and the Great Commandment."